My 17-year-old son has always been interested in how and why things work. I can remember many Christmas mornings when the family would look on in astonishment as he painstakingly took apart his toys instead of playing with them. But, he was playing with them; in his own special way. Over the years I’ve envied his aptitude and wondered how he acquired it. I mean, I seemingly didn’t posses it. And I know his mother didn’t. But, in studying the hows and whys of my panic and anxiety pathology, I’ve discovered I really do share my son’s innate need-to-know curiosity. Acknowledging and accepting my genetic predisposition for anxiety, I’ve learned to manage my life by focusing upon things I have the ability to manage. So, time and again I tell myself, “Bill, it’s all in your interpretation of events and subsequent reaction.” After years of practice it comes naturally to me now, and it just plain works. Still, I want to know how and why. That’s led me to my current fascination, fear memory. This is a way huge topic to address, which easily merits an entire book. But, I’m going to share what I’ve learned in three, maybe four, posts. The first in the series will set the table for what’s to come by addressing some neuroanatomy and physiology involved in fear memory. Well, let’s get busy. A crescent-shaped bit of anatomy that in cross-section resembles a seahorse, the hippocampus curves in an upward direction toward the back of the brain from the amygdala. The hippocampus, phylogenetically one of the oldest structures in the brain, is huge in memory. The word, “hippocampus,” comes from the Greek, “hippos,” meaning horse, and “kampi,” curve. This is the ultra-thin top layer of the cerebral cortex, covering the entire surface of both brain lobes. Among many things, it’s the home of our sensory perception, the generation of motor commands, spatial reasoning, conscious thought, and language. 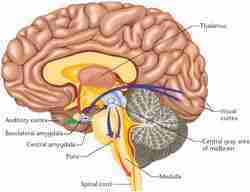 For our immediate purposes the primary visual cortex, located in the occipital lobe, is a portion of the neocortex. The physiological interaction of the brain structure known as the hypothalamus, the pituitary gland (just below the hypothalamus), and the adrenal glands (at the top of the kidneys). These three pieces of anatomy work together to regulate functions and states; such as stress response, mood, digestion, immune response, sexuality, and energy usage. The end result of the action of the HPA axis is the secretion of the “stress hormone,” cortisol; and the activation of our fight/flight response. So now we’ve put the silverware, plates, glasses, and napkins on the table. Look for tomorrow’s post as the fear memory meal is served.